I never met a soul who didn’t like pizza (even my cheese-hating ex eats more pizza than anyone I know). And though I may have grown up but an hour from Chicago, I could never get into deep dish. If the toppings are great, I’m going to want to consume more square inches of that pizza and less “breading” underneath those scrumptious add-ons. Let’s just say that one sausage patty-topped DowntownÂ Gino’s East pie has once stopped me dead in my tracks…after half a slice. I like meat, but I don’t like my pizza overwhelming. EnterÂ the 4 1/2-month old, eco-conscious pizza franchise installment in West Hollywood called Pizza Fusion Hollywood. I was recently invited to partake in the pies at this casual hang-out, which on a weekday nightÂ was well packed with whom it seemed to be locals. Their produce follows suit (or precedes – you pick), with a conscious effort to source from nearby farmers and use organic ingredients.Â Vegans will find a gluten-free crust available at Pizza Fusion as well as plenty other menu items – including wines and beers – that are kosher for consumption with “V” next to their listing as indication. Does wine fit your fancy? Pick from a handful of Californian Syrahs or perhaps an Argentinian Malbec; only a couple on the wine list happen to be non-vegan. Other casual diners will also find a fabulously-priced and small -Â but choice – beer list. The Boont Amber Ale from the solar-powered Anderson Valley Brewery was a first for me – and a deliciously pleasant one, at that! 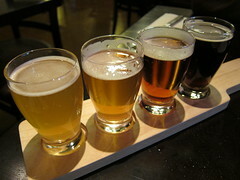 Unibroue Blanche de Chambly was the yang to their Chambly Noire’s yin – but no worries if you can’t decide, because beer flights are available so you can get a little bit of each. Vegetarians and non-vegetarians alike will appreciate their Zucchini Al Forno appetizer, with a roasted halved zucchini topped with a mixture of feta, walnuts andÂ pepper. As for the mains, come here for the, well,Â pizza. 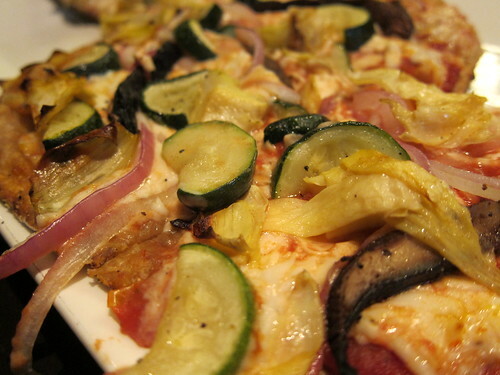 The vegetables are fresh and the crust is moist with good crunch. I was in for a not-so-rude – refreshing, actually -Â awakening with their Farmer’s Market Pie complete with soy cheese. Not that I am well-versed in all matters of cheese substitutes (lest my Wisconsin heritage disown me) but this cheese’s milkier textureÂ complimented the vegetables also atop the pie quite well. I had no idea what I was “missing.” Pizza Fusion’s spinach and artichoke pie was also divine – with no shortage of tender artichoke heartsÂ to go around. Their Sausage with Tricolor PeppersÂ topping was the perfectÂ peppery-sweet combination – perfect for my inevitable carnivorous protein fix. 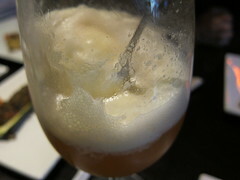 And you have every reason to look forward to dessert; this is one of the under-the-radar joints to have beer floats available. Always thought it was weird to consider beer as a dessert? Get the Lindemans Lambic peach variety complete with vanilla gelato. This particular lambic, while too sweet for my tooth alone or even paired with food, was perfect for dessert.Â The floatÂ satisifed my sweet and beer tooth! 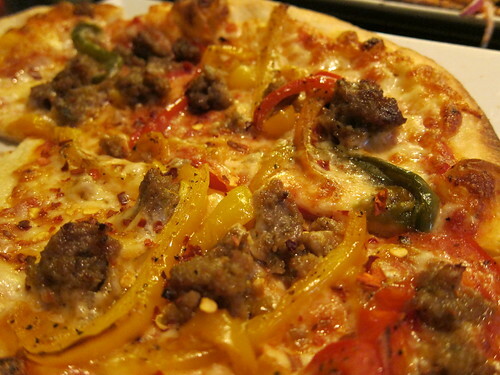 With delicious pies running you a respectable $9.99 – $10.99 per personal serving and $6 deliciousÂ beers on tap, it’s hard to find a reason not to visit Pizza Fusion Hollywood should you find yourself in West Hollywood. Crunch, the Sunset Laemmle theatre and Burke Williams Spa may be in the same strip mall, but their philosophy, price point and product are decidedly without fluff. All aforementioned food was hosted. This entry was posted in Food, Happy hour, Hollywood, West Hollywood and tagged Anderson Valley, beer, Daiya cheese, gluten-free, Happy hour, Hollywood, organic, pizza, Pizza Fusion Hollywood, Unibroue, vegan, vegan beer, vegan wine, Vegetarian, West Hollywood, wine. Bookmark the permalink.